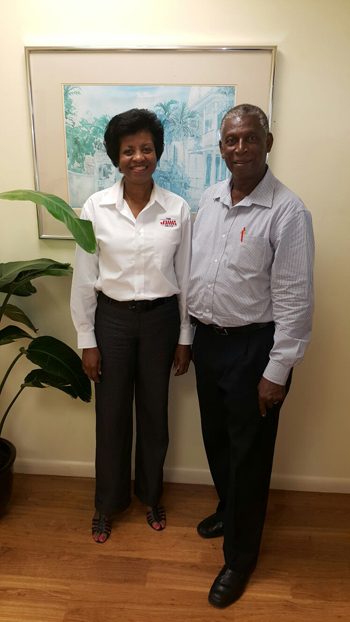 Sharon Gibson, General Manager of JMMB (Jamaica Money Market Brokers) paid a courtesy call on Mr. Patrick Hanlan (right), Jamaican Consulate in the Bahamas. Sharon Gibson, General Manager of JMMB (Jamaica Money Market Brokers) Money Transfer, a remittance partner of Omni Money Transfers, paid a courtesy call on Mr. Patrick Hanlan Jamaican Consul General in the Bahamas. During the visit Ms. Gibson expressed the desire and need for strengthening of ties between Jamaican residents in the Bahamas and Jamaicans in Jamaica through community outreach programs in the Bahamas and abroad. Ms. Gibson also stated that it is the intent of JMMB to work with partner companies such as Omni Money Transfers to give back to the local Bahamian community as well. As a part of her visit to Nassau, Ms. Gibson also made a special presentation to Marcia Desouza, a longstanding customer of JMMB and Reggae Money Express. Mrs. Desouza was more than pleased to receive the gifts of appreciation which included a credit towards her next remittance to Jamaica through Reggae Money Express and Omni Money Transfers. Mr. Richard Blake, Manger of Sales Outlets and Agency Network at Omni, was present during the presentation to express the commitment of Omni in providing quality service to all of their customers, and to thank customers like Mrs. Desouza for longstanding patronage of Omni and its services.